OHIO VALLEY — Commissioners from across the state of Ohio had the rare opportunity to meet with top officials in the federal government during a trip to Washington D.C. which included a conference in the Eisenhower Building next to the White House. 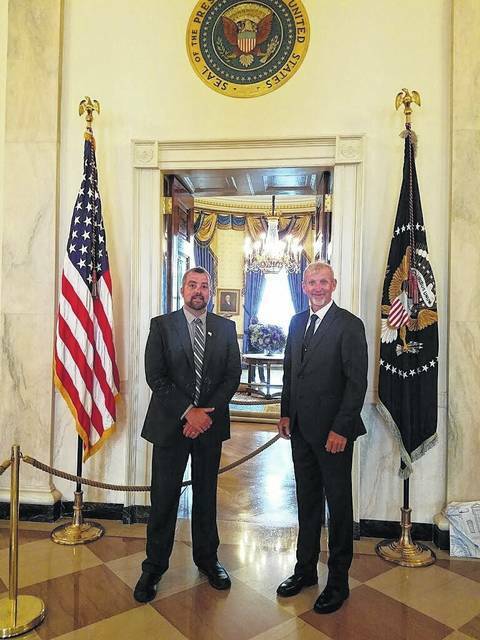 Meigs County Commissioners Randy Smith and Tim Ihle and Gallia County Commissioner David Smith were among the approximately 80 commissioners and local officials to attend the conference and White House tour organized by the Department of Intergovernmental Affairs. Ohio commissioners are the fourth group of state officials to be invited to Washington D.C. for similar meetings. “This was not an opportunity to go and say we were able to see this person or that person, it was an opportunity to meet with them and for them to listen to our concerns,” said Randy Smith. There was an individual person to represent each cabinet department who was there to hear the concerns of the county officials and to answer questions. In addition, Vice President Mike Pence, Advisor Kellyanne Conway and Deputy Chief of Staff for Legislative, Intergovernmental Affairs and Implementation Rick Dearborn were among those in attendance. Some of the Secretaries and President Donald Trump were in Texas on the day of the conference due to Hurricane Harvey. It was overwhelming the welcome we received and how they welcomed the information, questions and even criticisms,” said Randy Smith. “You could tell they were there to gather information,” said Randy Smith of the federal officials. The officials also provided the commissioners and local officials with contact information to have a direct contact with federal officials at such places as FEMA, the EPA and Army Corp of Engineers. After not having these connections, Randy Smith explained that this will allow of a phone call to agencies rather than filling out a form on a website and being another number. The Vice President spoke to the group thanking them for their leadership on the local level and the hard work they put in. He expressed the desire to work with the local officials to achieve goals. In addition to networking with the federal officials, the commissioners had the opportunity to meet with one another. “It was good to see David Smith from Gallia, Tim Eberts from Vinton and Ron Feathers from Washington,” said Randy Smith and Ihle. They explained that having this shared experience and connections will allow them to work together on potential regional issues to reach out to those at the federal level for assistance. One of the main topics of discussion was infrastructure. Federal officials explained that much of the nation’s infrastructure is maintained, built or operated at the local level, meaning that the federal officials are not always aware of the issues and concerns until they are notified of the problems. Allowing for the local officials to share their concerns directly also brought about issues which could be remedied to make the process of securing federal funds for a project easier. Randy Smith said an example given by another commissioner, and referenced by Meigs County Engineer Gene Triplett on other occasions, was the increased cost of projects once the federal government becomes involved. A local engineer’s office can construct a new bridge for a cost of $300,000, but for the same project to be handled and funded at the federal level it would cost $1.2 million for the same exact bridge. It is the amount of “red tape” that comes with the federal projects that increases the costs, something that the federal officials can look into after hearing the concerns. The REC was first enacted in 1936 and pushed federal loans to rural areas for the installation of electrical distribution systems. Much of the funding was put into cooperative electric power companies which are still in use. Grant funding such as Community Development Block Grant and Appalachian Regional Commission funding were also discussed. Dearborn explained that for the past several administrations the ARC funding has been at zero dollars in the presidential proposed budget, but given its importance to the area it serves continues to be funded in the final budget each time. Ihle said that the officials were also prepared to discuss the Medicaid Managed Care Organization sales tax loss, explaining the federal position on waivers to replace the tax loss. According to the commissioner, the federal government does not have an issue with approving a waiver for a fee (which has been done for the state’s funding but not the county’s) as long as the money from the fee does not exceed the money that was generated from the sales tax. The current issue could be that the waiver approved for the state level funding is more than the sales tax the state had been receiving. As state and county officials in Ohio continue to negotiate on the matter, Ihle said the hope is that the administration would seek to adjust the waiver and divide the funding with the counties and transit authorities to make it fair. Ihle said that often as he or Randy Smith would raise their hand for a question one of the other commissioners would ask the same question before it came to their turn. Ihle said that they left the conference and the trip “pleasantly surprised” and “optimistic” for the potential of working with those at the federal level. Commissioners were also treated to a tour with Randy Smith explaining it was the same as what the public can take when visiting the White House. For their purposes, the walk through the White House was the passage way to the Eisenhower Building which is located next to the White House and is where the majority of cabinet officials and support staff have their offices. According to the U.S. General Services Administration, the Dwight D. Eisenhower Executive Office Building (EEOB) was built between 1871 and 1888 as the State, War, and Navy Department Building, bringing these rapidly growing interrelated government departments together under a single roof. The Navy outgrew its space and left in 1918. The War Department outgrew its space and left in 1938. The State Department followed in 1947. In 1949 the building became the Executive Office Building to better identify its occupants, the Bureau of the Budget and White House staff. In 1955 President Dwight D. Eisenhower held the first televised presidential press conference in the Indian Treaty Room. The building has housed all Vice Presidents and their staffs, beginning with Lyndon B. Johnson. It has been associated with people, events, and decisions of great historic importance to the country. In 1957 the President’s Advisory Commission on Presidential Office Space recommended demolition and replacement with a modern office building. This recommendation was never implemented. Designated a National Historic Landmark in 1969, the building is also within the Lafayette Square National Historic Landmark District. It was renamed the Dwight D. Eisenhower Executive Office Building in 1999 and rededicated in 2002. Meigs County Commissioners Randy Smith and Tim Ihle. https://www.mydailytribune.com/wp-content/uploads/sites/42/2017/09/web1_White-house.jpgMeigs County Commissioners Randy Smith and Tim Ihle. 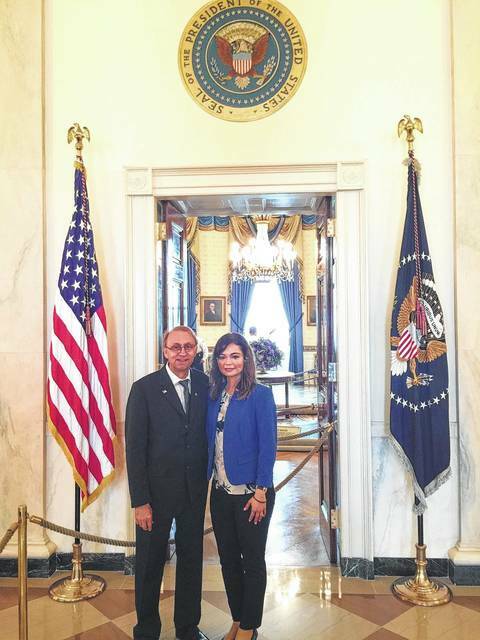 Gallia Commissioner David Smith stands with his wife Shana Smith at the north entrance to the White House.